The U.S. Olympic Team Trials 50K Race Walk will be held in Santee Sunday, with two San Diego area walkers among the top contenders to qualify for the Rio Olympics. Bonsall resident John Nunn is the only walker in the trials to have met the Olympic “A” qualifying standard of four hours, six minutes. Nick Christie of San Diego is the next closest walker in the field to the Olympic qualifying standard, completing the USA Track & Field 50K Championships on Nov. 22 in 4:11:48 on the same 1.25-kilometer looped course that will be used for today’s race. The top three finishers who have met the Olympic “A” qualifying standard will be nominated to represent the U.S. in the 2016 Olympics. The race is set to begin at 7 a.m. and will be held along Mast Boulevard between Magnolia Avenue and Jeremy Street, just south of Santana High School. Admission is free. The 50K walk is the longest race in track and field offered in the Olympics, about five miles longer than the marathon. The winner will receive $10,000 and each of the next six finishers are also guaranteed to receive prize money from a purse of more than $33,000. To qualify for the trials, walkers must have completed a 50K race in 4:45 or less between Nov. 24, 2013 and Jan. 31. Nunn, who turned 38 on Feb. 3, won the 2012 Olympic Trials, which was held on the same course. He finished 43rd in the London Olympics in a personal- best time of 4:03:28. He finished 26th in the 20K walk in the 2004 Olympics. Nunn runs a gourmet cookie business, Ella’s Cookies, with his daughter Ella. The 24-year-old Christie is a graduate of Grossmont High School who switched from cross country and track and field to race walking after a year of competing at Cuyamaca College. He won the two-mile race at the 2015 USA Track & Field Indoor Championships. Walkers are required to maintain contact with the ground at all times. The leading leg is required to be straightened as the foot makes contact with the ground. It must remain straightened until the leg passes under the body. 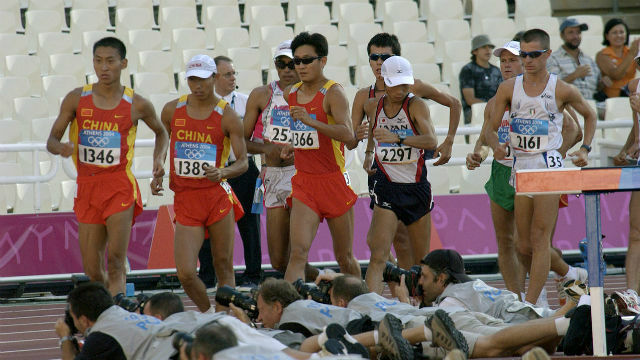 Judges evaluate the technique of race walkers and report fouls which may lead to disqualification.